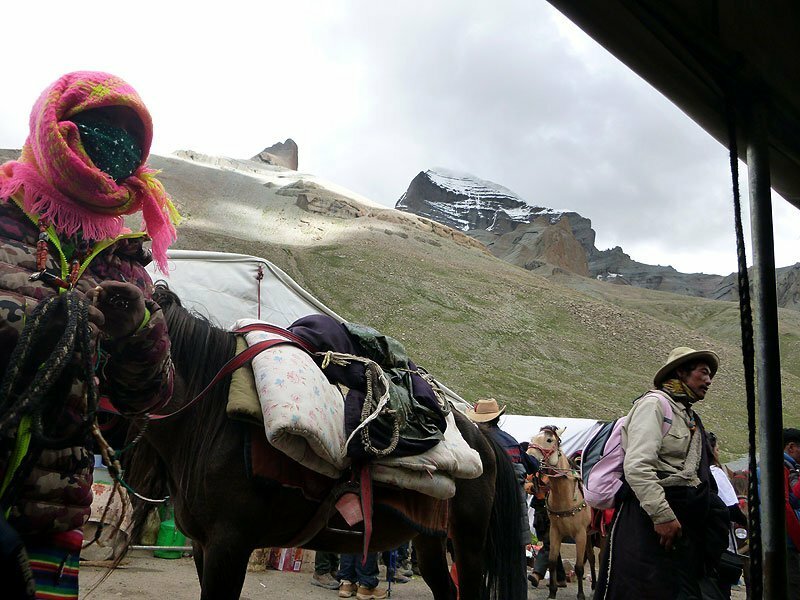 What’s it like to do the Mount Kailash Yatra? 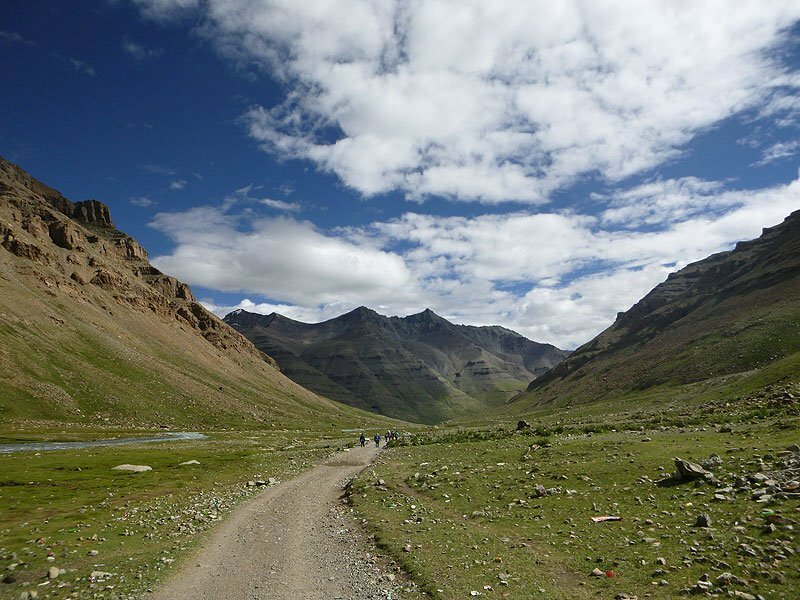 Swami Govinda shares his life-changing experiences of walking the full Outer Kora; starting at Lake Manasarovar, then Yama Dwar, Dolma Pass and Gauri Kund. With HD photos. I was once given the opportunity to look after my Guru’s shrine, Guru Sri Subramanium, whilst He travelled to Switzerland for a week. Looking in a drawer for matches to light the lamps, I came across two pictures, one of a perfectly domed mountain, the other of a glacier, with what appeared to be a small river flowing out from underneath it. Enthralled by the domed mountain, on Guru’s return I asked Him what it was, and could I have the picture for my shrine. He said no, but then proceeded to give me the glacier picture, which turned out to be Gaumuk, the source of the Ganges. I wasn’t totally happy with the outcome; it was the mountain that sparked a deep resonance, but that was how it was. A year later; the same situation lighting lamps, looking for matches, and again I came across the picture of the same mountain. I looked at it every night for the week I occupied Guru’s room. When Guru returned to Skanda Vale I moved back into my own room and, somewhat defiantly, the picture of Kailash joined me. It formed the centre of my shrine, and still does. 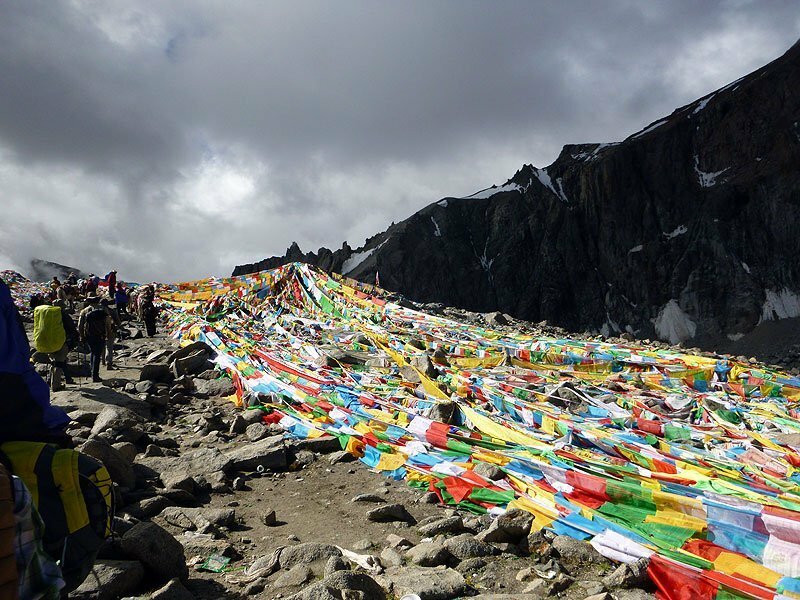 All of that happened the best part of twenty years ago, and ever since Kailash has been the only place on earth that I desired, actually longed, to visit. 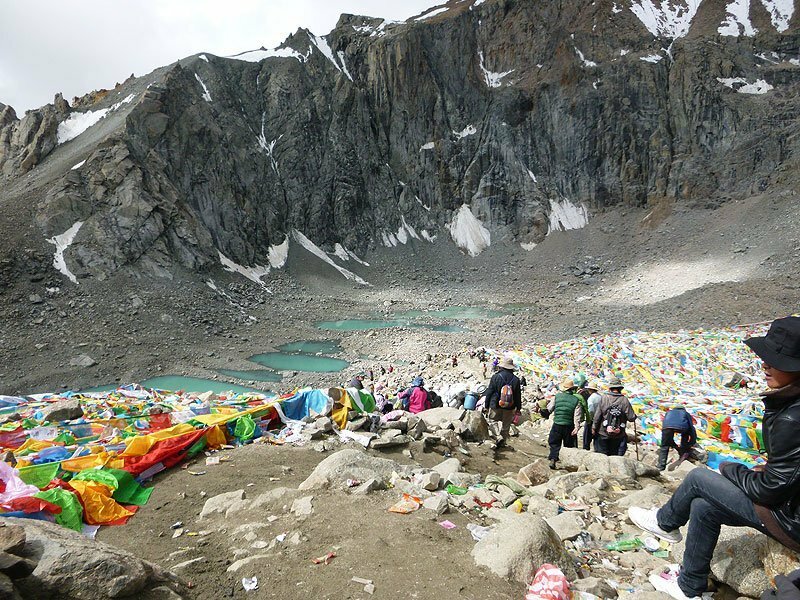 A year or so later it happened that Mohanji was organising a large group for pilgrimage to Kailash. Members of his organisation had mentioned this to a member of Skanda Vale Community who told them of my love for Kailash. Later that day they bumped into me and I just said that when they come back from their trip they have to tell me absolutely everything. 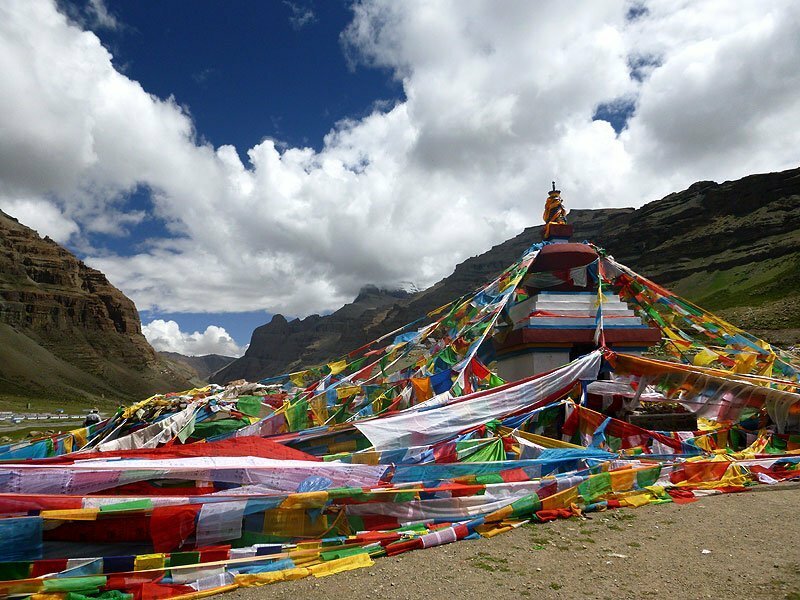 Unbelievably a space for that pilgrimage became available and at the age of 45 I was suddenly on my way to Kailash; everything very beautifully arranged. 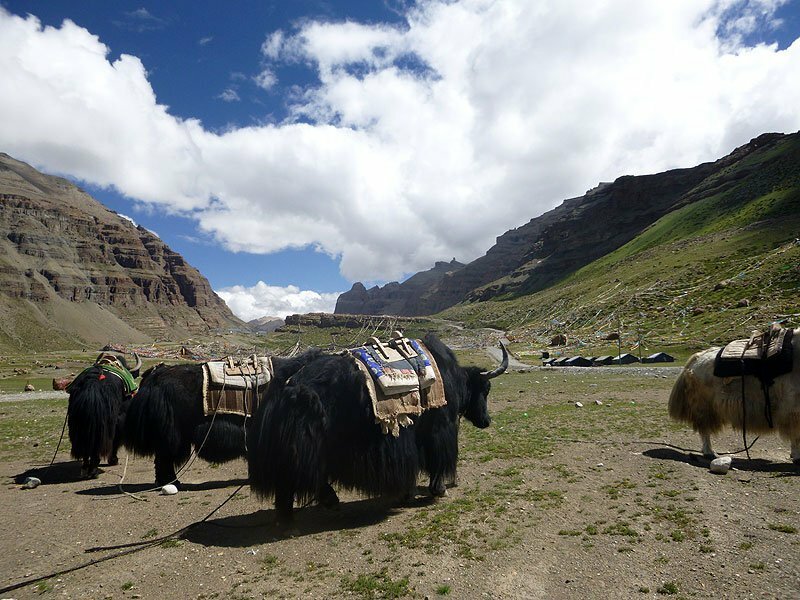 We arrived in Tibet against all odds. 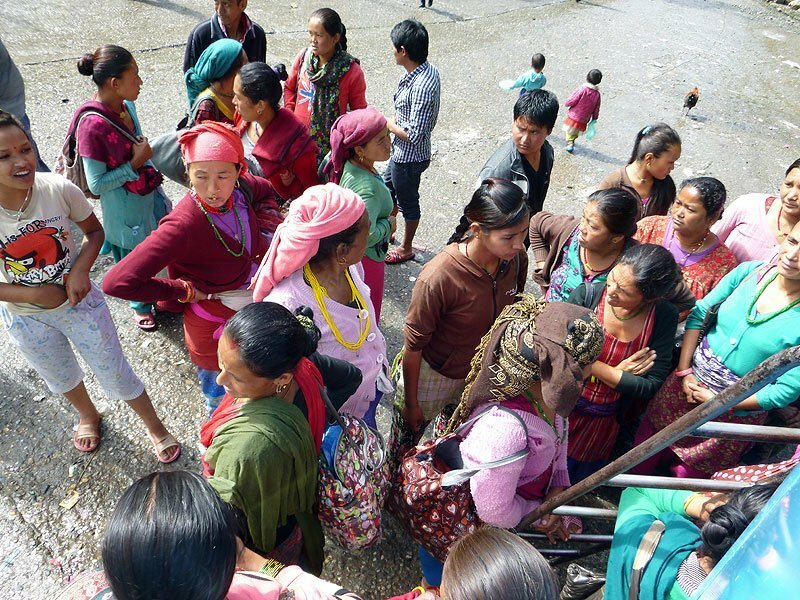 Amazingly, all 100 people in our group obtained a visa from the Chinese authorities, whilst some 1000 people remained stranded in Kathmandu, just waiting. 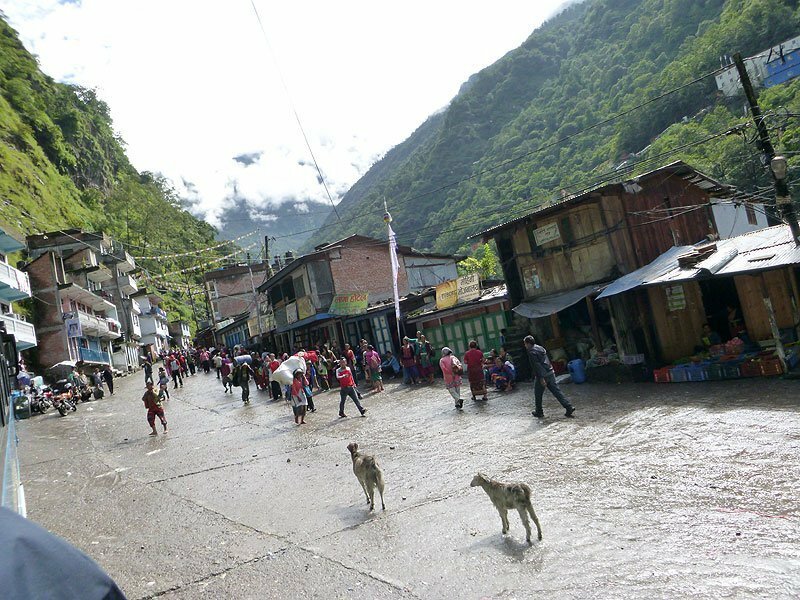 Driving up through Nepal, some overnight extreme rain caused a major landslide, making our route to the Tibetan border impassable. 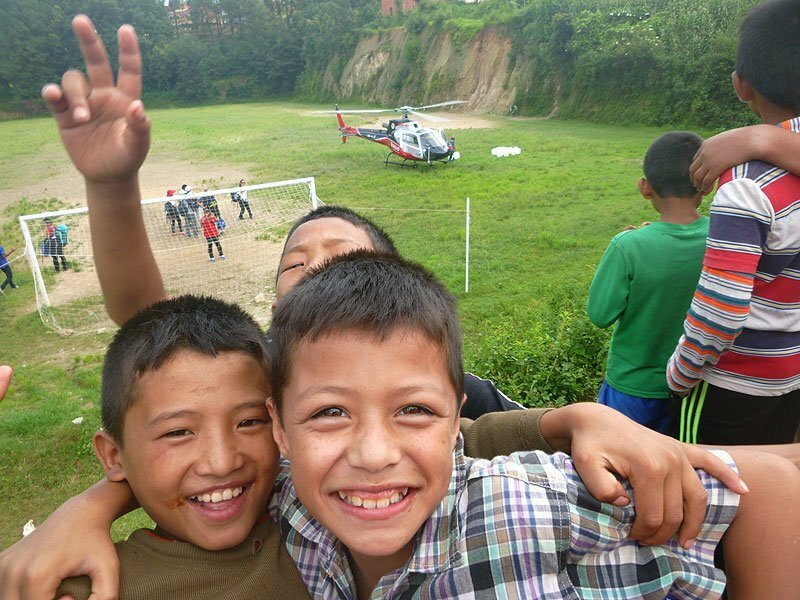 Unbelievably, helicopters were made available and all day, five helicopters at a time were flown over the devastated area. 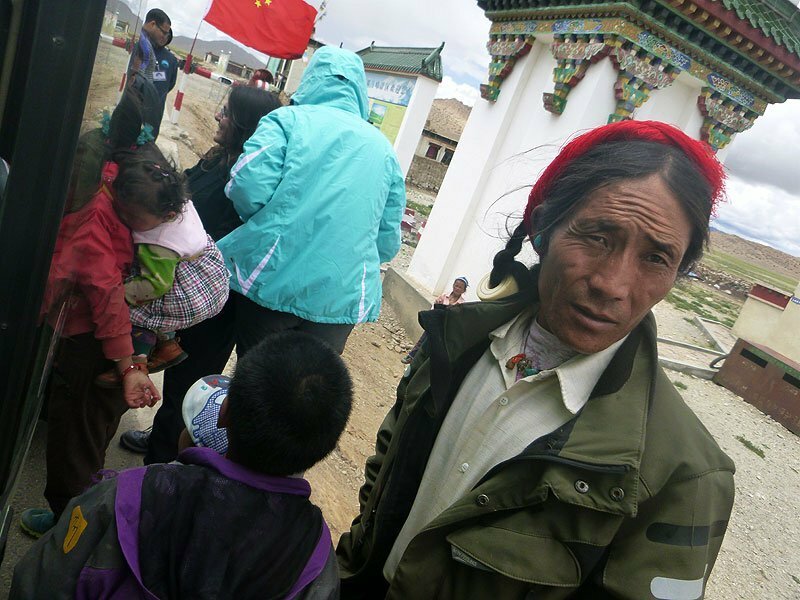 On Friendship Bridge, the border between Nepal and Tibet, I spent an agonising 15 minutes with armed Chinese left and right, waiting for permission to cross. It really felt like touch and go. It was then that I fully realised the extraordinary grace that surrounded us, enabling this dream of a pilgrimage to become real. Budhan Ilkantha Temple in Kathmandu (also known as the Sleeping Vishnu temple). Shiva temple near Kathmandu with 12 lingams. 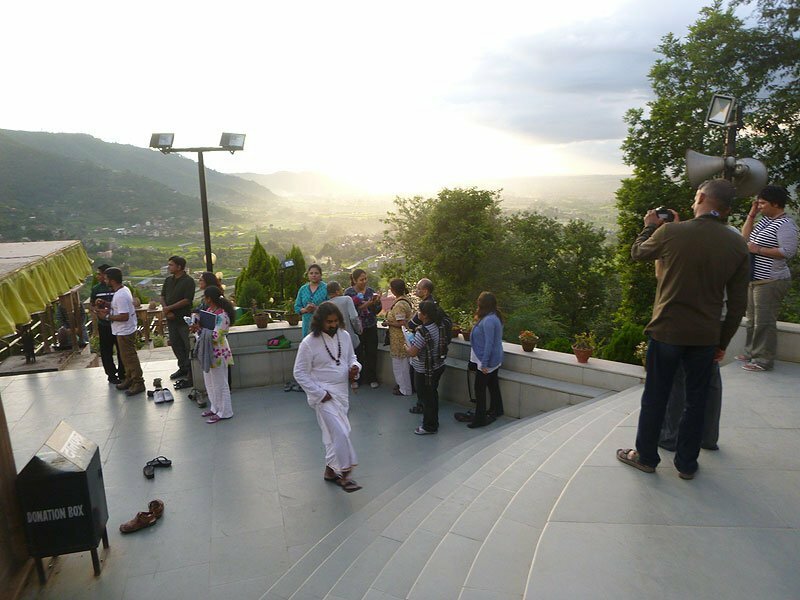 Mohanji and devotees on the Shiva temple steps. The whole village came out to see the helicopters. The last village in Nepal, before we cross into Tibet. A crowd gathers to help us with our luggage. 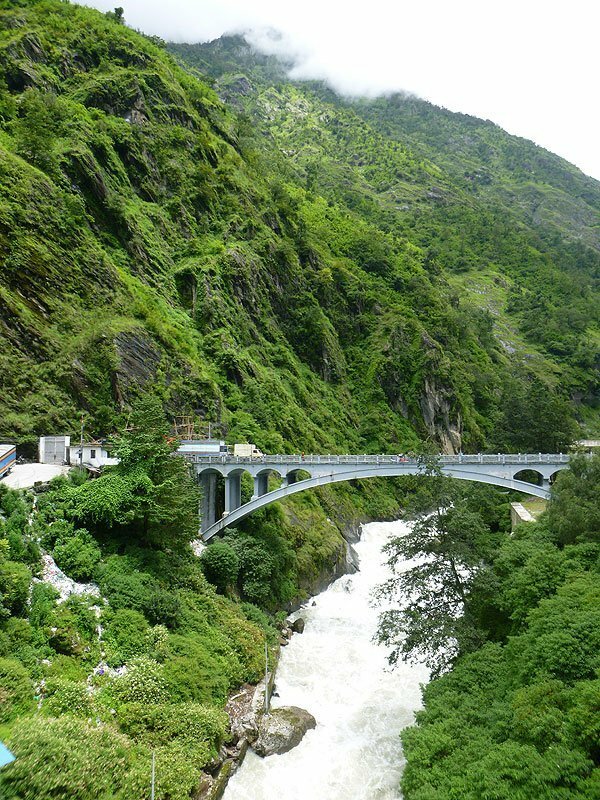 Friendship Bridge, the border between Nepal and Tibet. 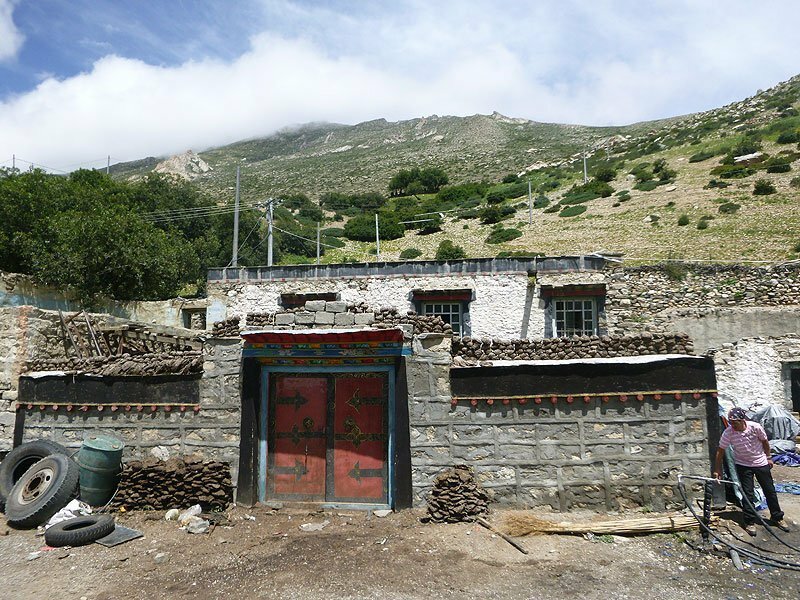 A typical Tibetan house with yak dung fuel bricks drying in the sun. 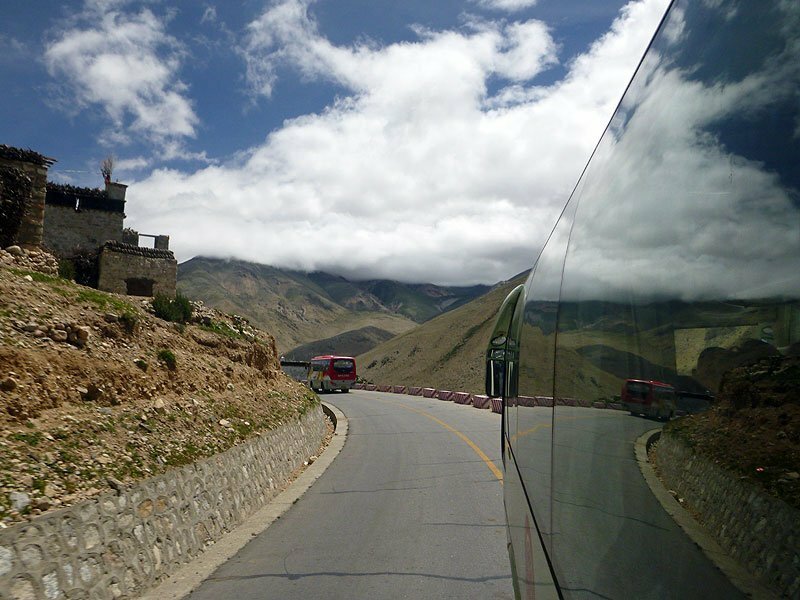 Travelling through the Tibetan mountains. 5800 metres above sea level. 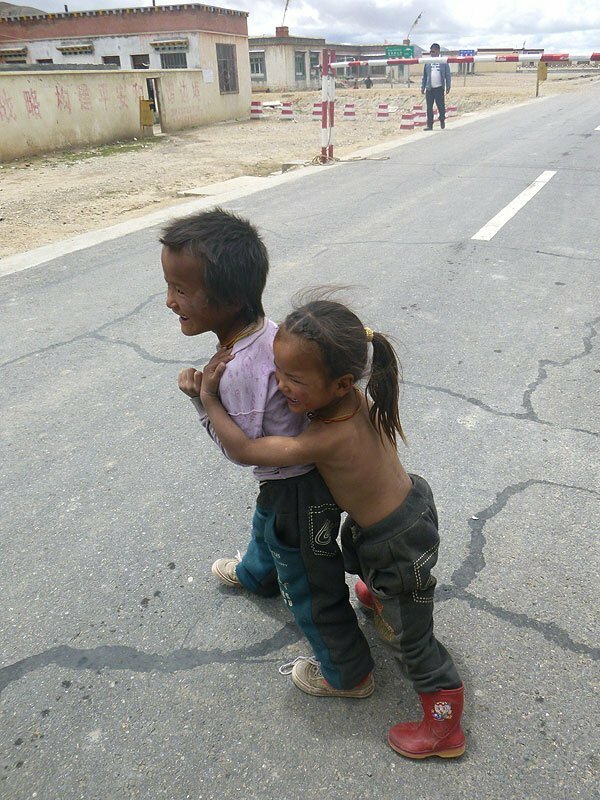 Tough Tibetan children at a Chinese checkpoint. The Tibetans found our party fascinating. The feeling was mutual. 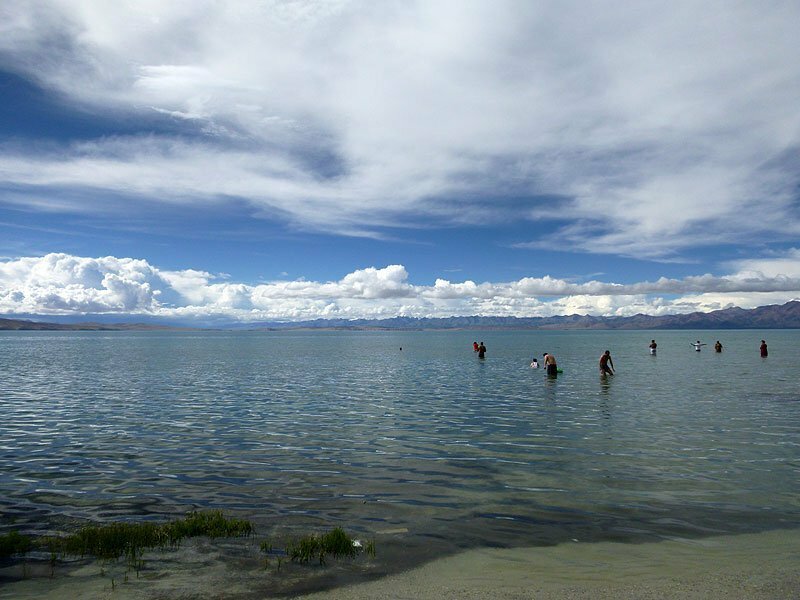 Pilgrimage to Kailash always starts in earnest at Lake Manasarovar. 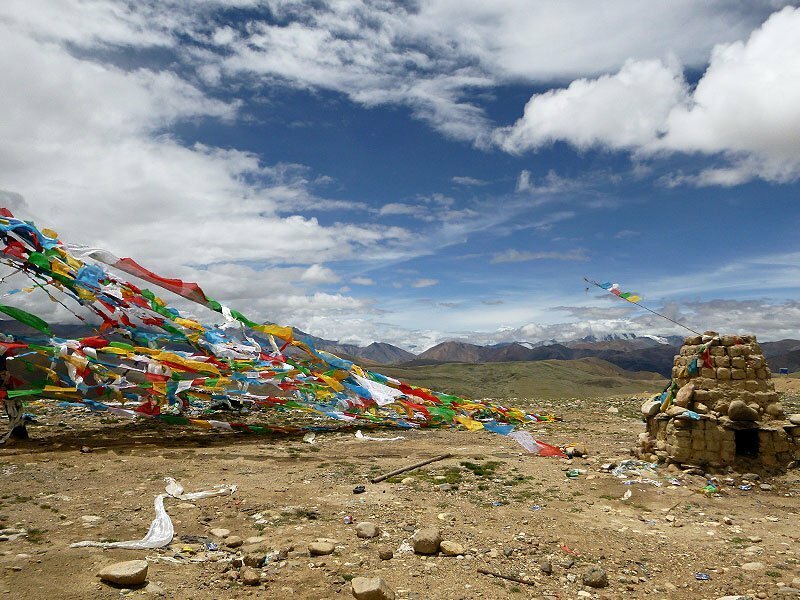 We had been travelling for three solid days through immense Tibetan valleys and plains and the increasing altitude was having its effect on most of the group. Manasarovar finally came into view and, as we skirted her edge, a snow clad Kailash appeared small but very distinct across a vast, vast stretch of water. 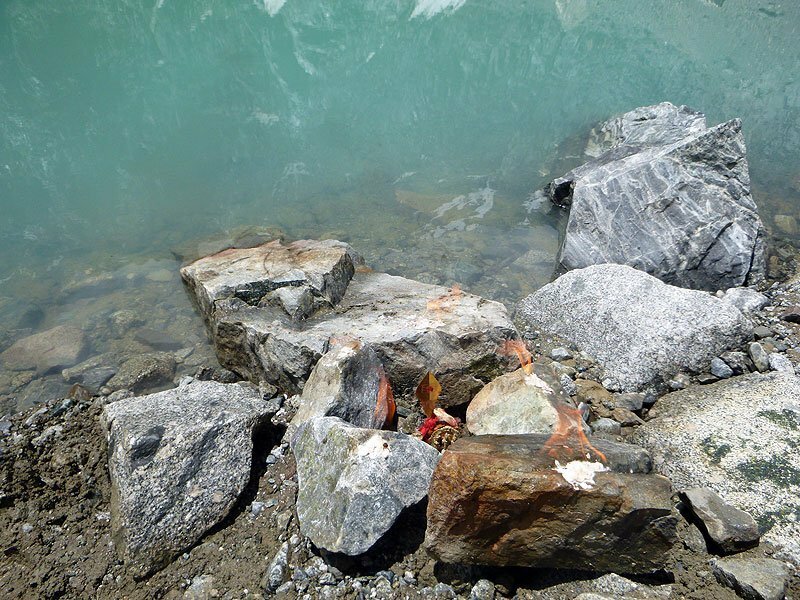 Bathing in these holy waters, drinking her purity, with Kailash in our sights cured the effects of altitude sickness and more; what an auspicious way to start. It is said that in the dead of night celestial beings descend on these waters to quench their thirst. For the next two nights we would wake to see small lights appear from nowhere, drop to the water, hover briefly and evaporate. We performed a yagam here to protect our way up towards Kailash. From Skanda Vale I brought kumkum from the six faces of Lord Shanmukha, tilacs from Maa Kali and Sri Ranganatha, ash from a yagam performed at Guru’s Samadhi and some vibhuti from a kumbum mahabishekam to Lord Ganesh in our Swiss Temple. One by one these were all offered into the flames by myself and others who had travelled from the UK. 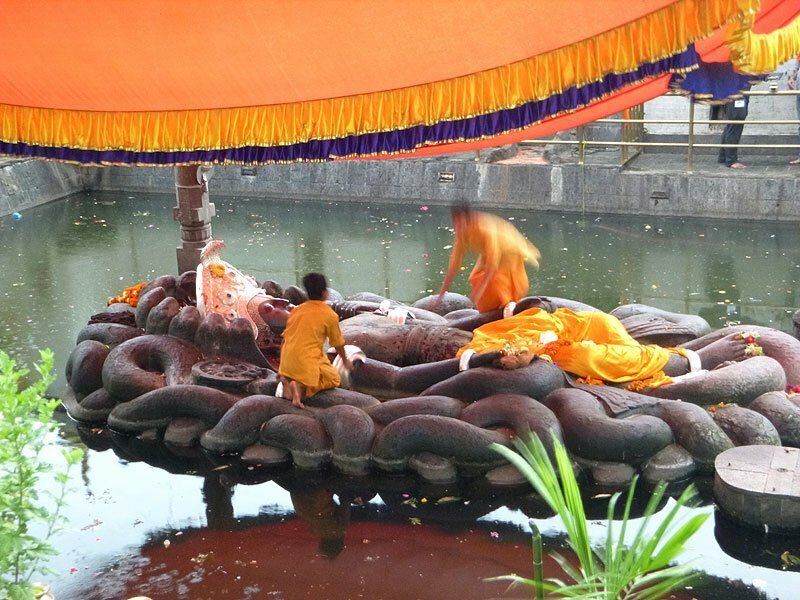 The effects of the yagam were extremely purifying and any signs of illness disappeared. 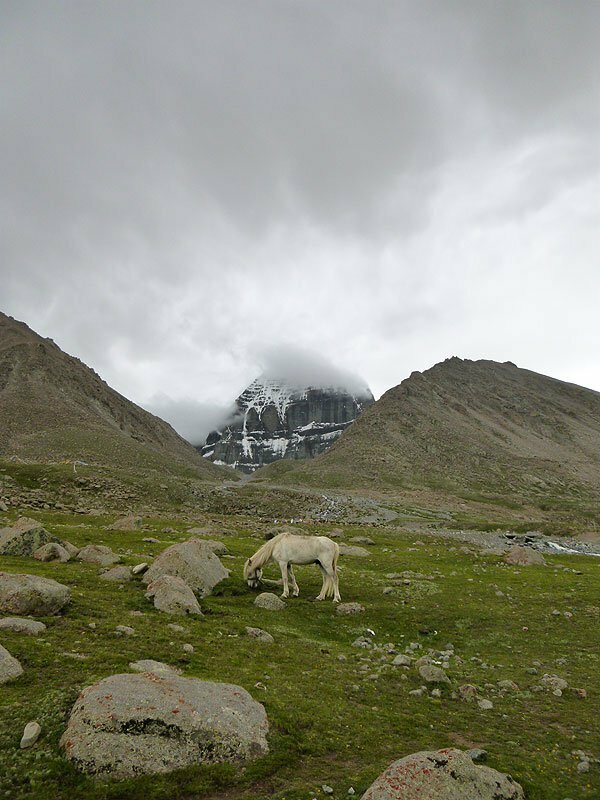 I went to Manasarovar again, bathed and offered a small bottle of water collected from the Sri Ranganatha Temple, then filled the bottle with Manasarovar water to offer back to Sri Ranganatha… all this with Kailash in full view. We were now ready to start the parikrama. 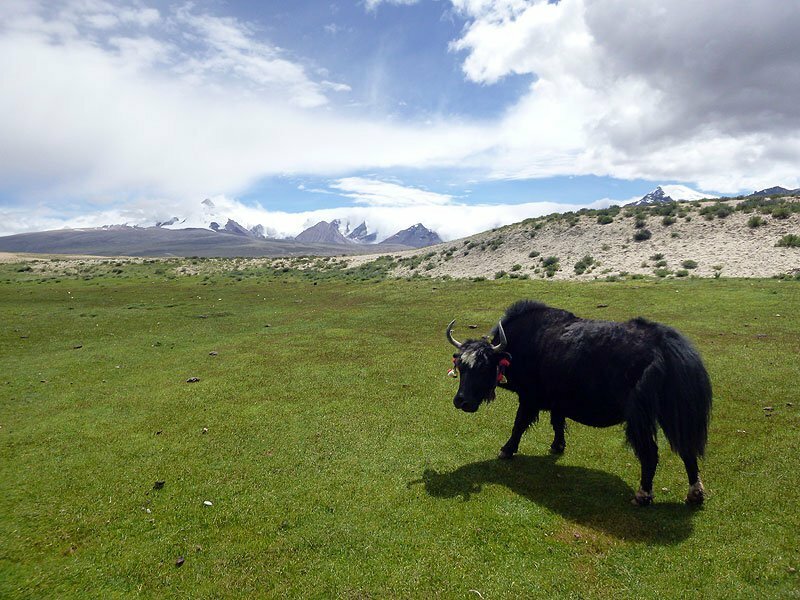 Early in the morning we travelled a short distance up to Darchen. After several passport checks, body scans and a thorough examination of all hand luggage, our paranoid Chinese friends deemed us fit for pilgrimage. The pilgrimage began properly with ritual bathing in Lake Manasarova. 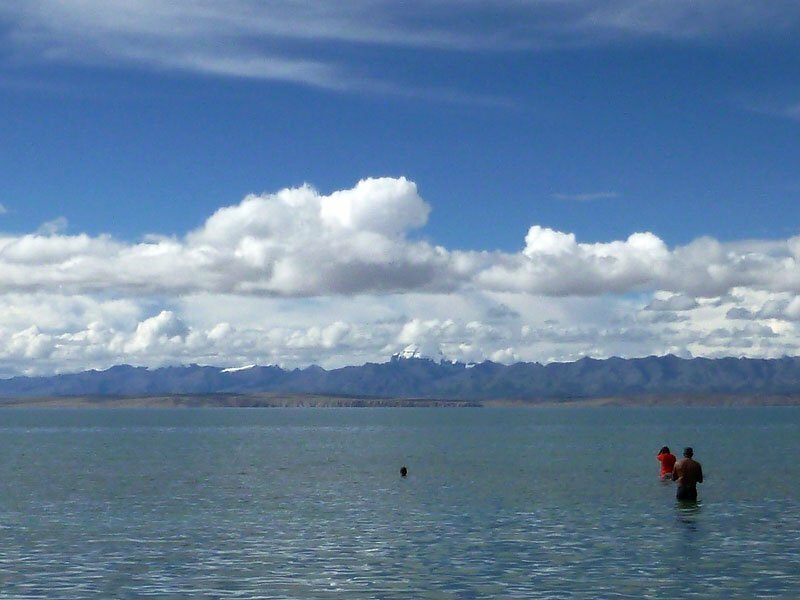 A close up of Lake Manasarova: our first sight of Mount Kailash (visible in the background). 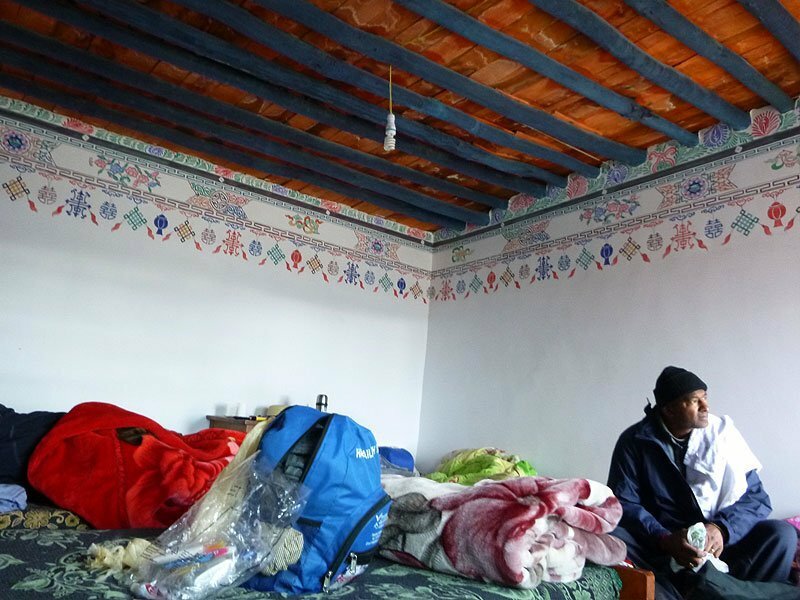 Rajesh feels the effects of the altitude in a Tibetan guesthouse. Approaching the start of the parikrama - the pilgrimage path. 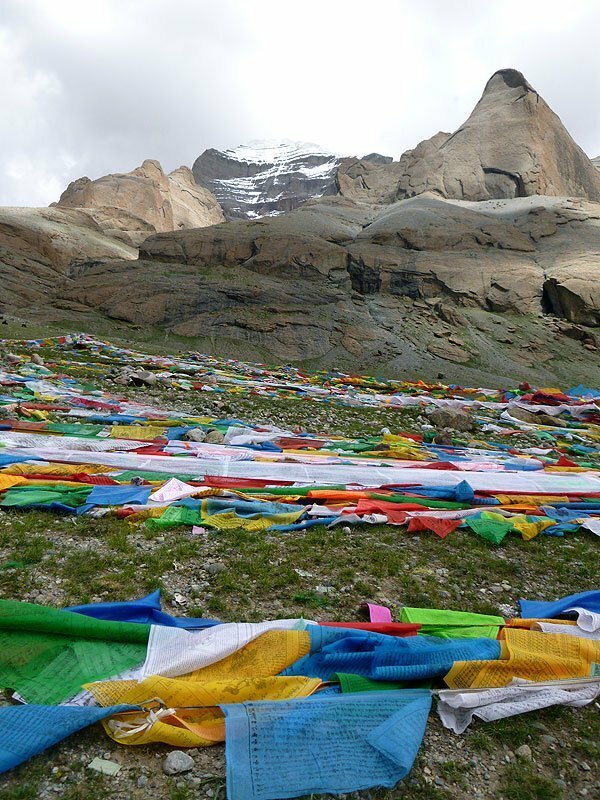 At Yama Dwar, I crawled under the streaming prayer flags and stood at the centre, whilst offering a small Skanda Vale trishul, asking for a safe and fulfilling journey for everyone. 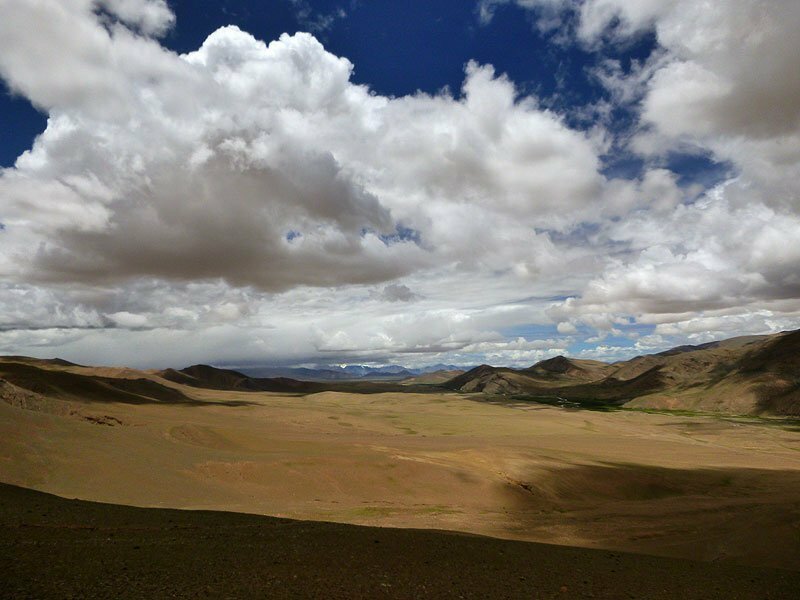 I then began walking into the most beautiful valley I had ever seen; immense mountains to my left and right, all resonant and vibrant. These vast rock structures appeared fluid and alive, their residing deities oscillating within. Mile after mile was filled with this wonder. I was totally overwhelmed to be in the presence of this great mountain. 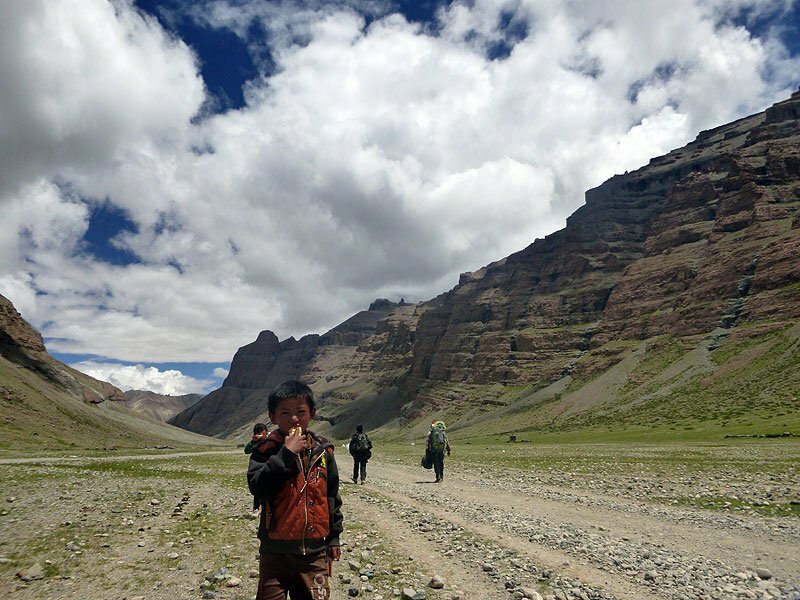 For hours we walked… the valley sides became even more extraordinary and then, set between a landscape from another world, rising high, high above me I first set eyes on the west face of Kailash. Dark, beautiful and of awesome power, nothing prepares you for this meeting. I stayed for some time and then slowly moved on, unaware of my hunger and thirst. Yama Dwar - the Gates of the Lord of Death. Pilgrims pass through before starting out. Gradually, altitude sickness set in and the best part of two hours was spent staggering along the rocky path, walking 10 minutes at a time, resting and narrowly avoiding passing out. 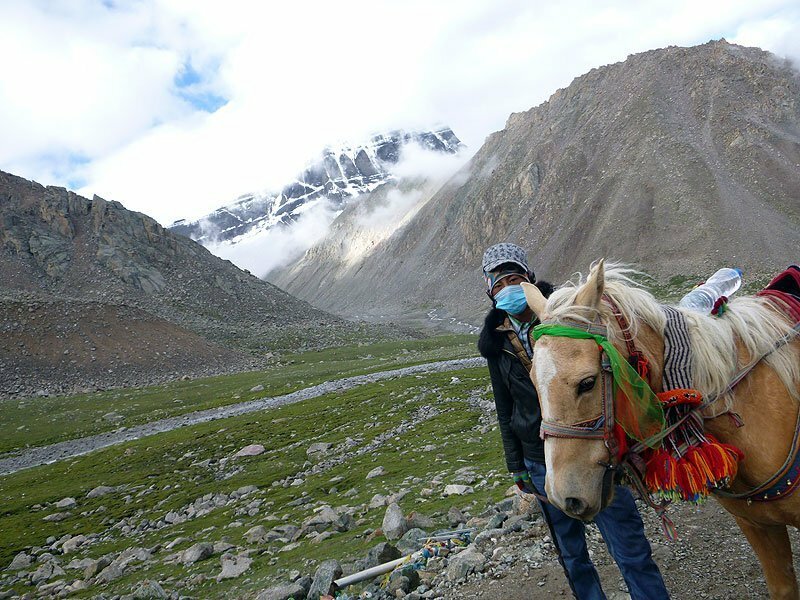 By the time we reached the north face of Kailash that evening, I was in a pretty sorry state. I just about managed to praise this mighty face (the face I had been worshipping for 20 years through a small picture on my shrine) then hauled myself up the stairs and crashed. My head was beating hammers – sledge hammers! Such a sickness and a fever like I had never known. A doctor was called and medicine given, with six gulps from an oxygen bottle. Within less than a minute I almost felt normal again. Still wondering if I would make the next day (a climb from 4800 metres to 5800 metres) I slipped into another unsettled night. 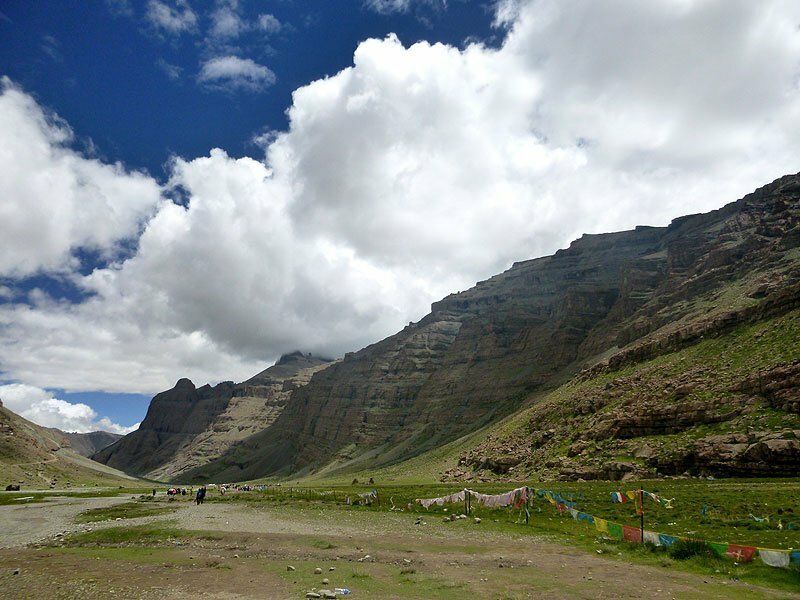 Our first full encounter with the west face of Mount Kailash. 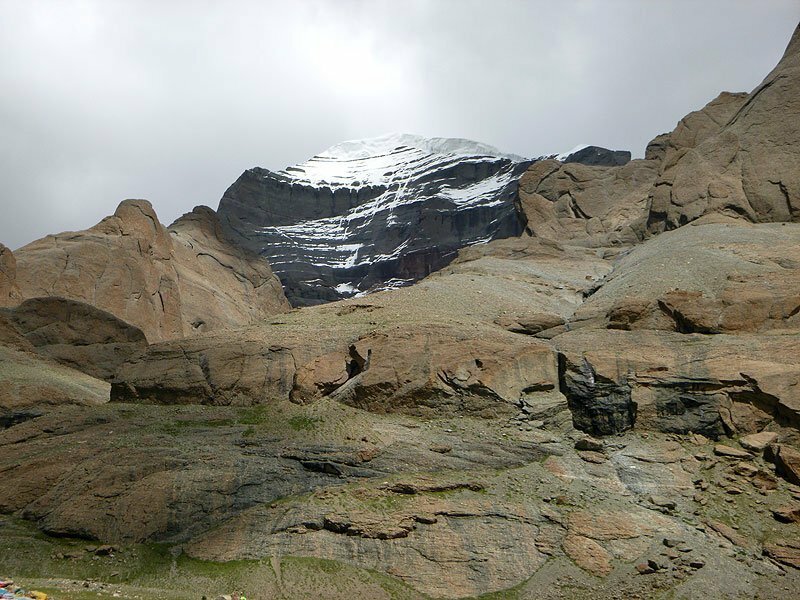 Darshan of the north face of Mount Kailash. The north east face, ascending toward the Dolma Pass. 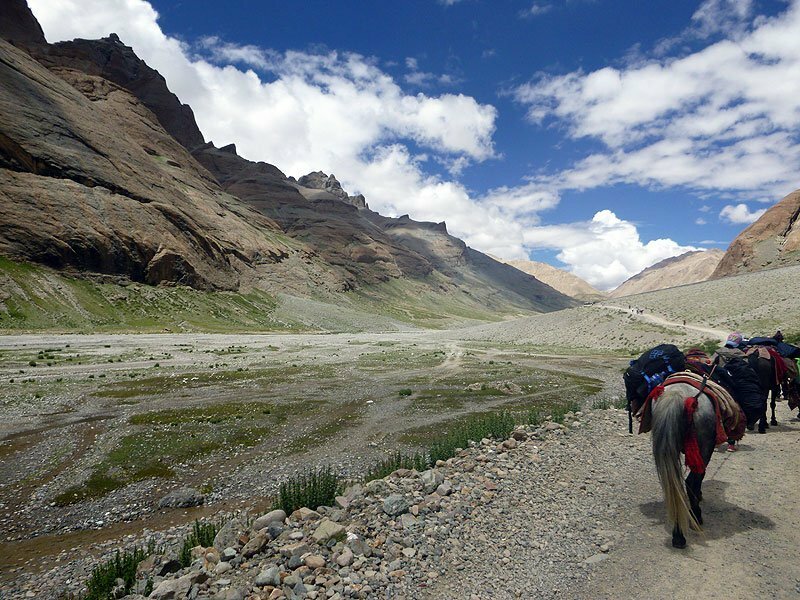 The morning brought some relief and, begrudgingly, I hired an emergency pony for the ascent. 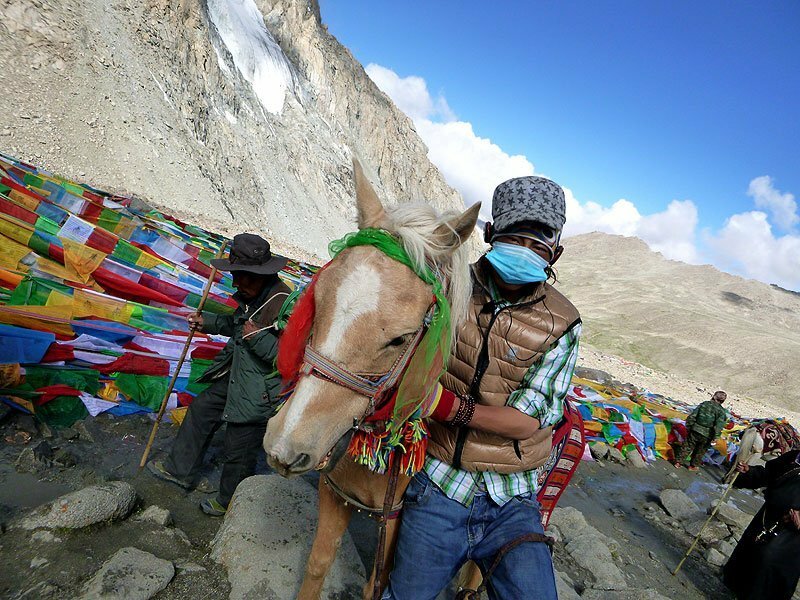 Four slightly humiliating and disconnected hours were spent in the saddle of this lovely Tibetan pony (who saved me from certain collapse) until we reached the amazing Dolma pass, where I parted company with my helper and started walking. 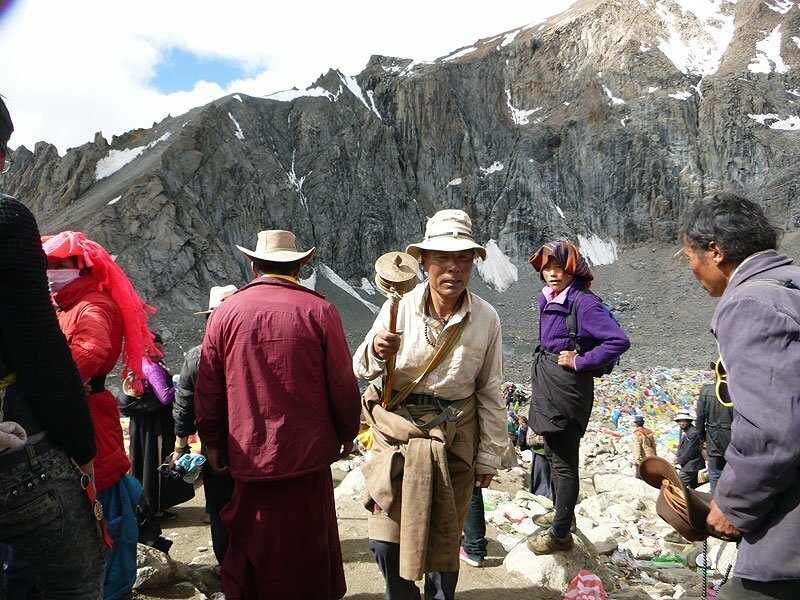 I sat for a long time amongst chanting Tibetans; hundreds of people converging on this pass, walking in both directions. The whole area was dense with devotion; the air thick with unseen traffic. Again, altitude sickness evaporated and everything started to change. Approaching the top of the Dolma Pass. Our porter loved Western dress and culture - almost as much as we love theirs. 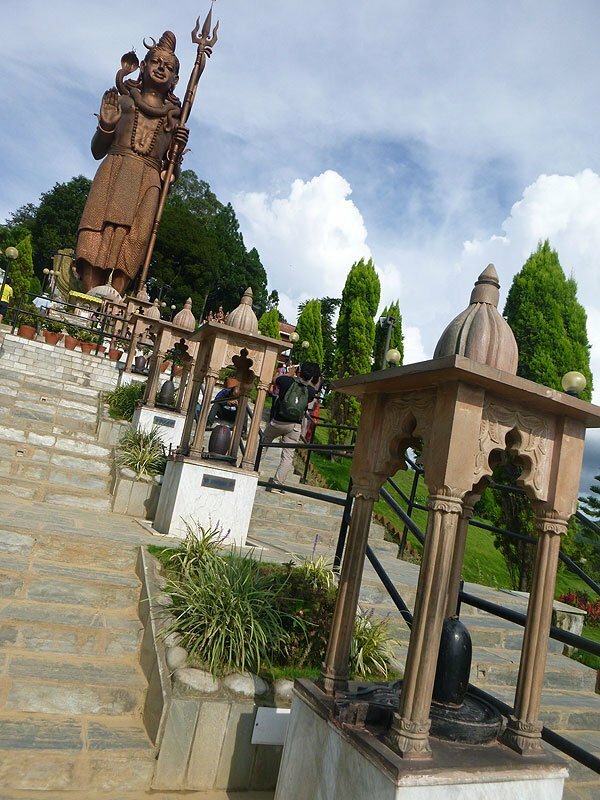 The mountain is equally sacred to Buddhists, Jains, Bons and Hindus. The descent to Gauri Kund. 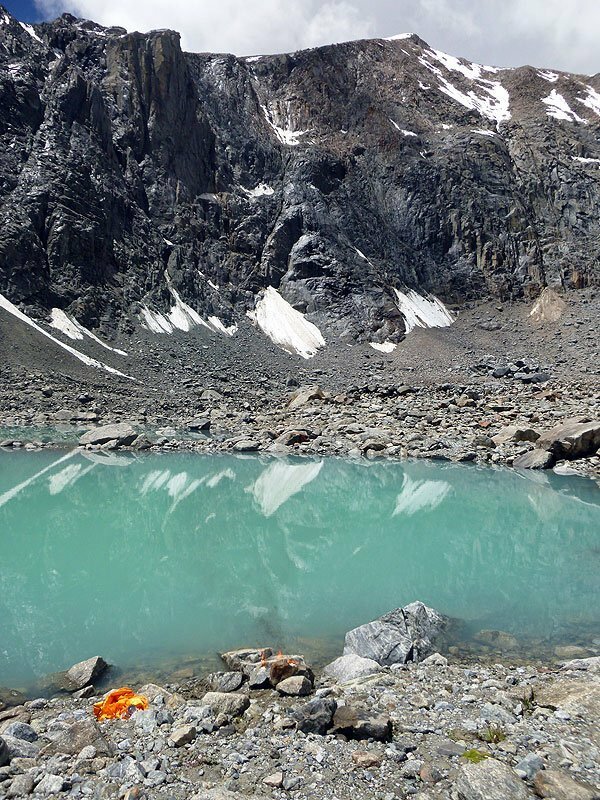 Gauri Kund - where Parvati did tapas for Lord Shiva. Offering Skanda Vale and friends at a puja by Gauri Kund. 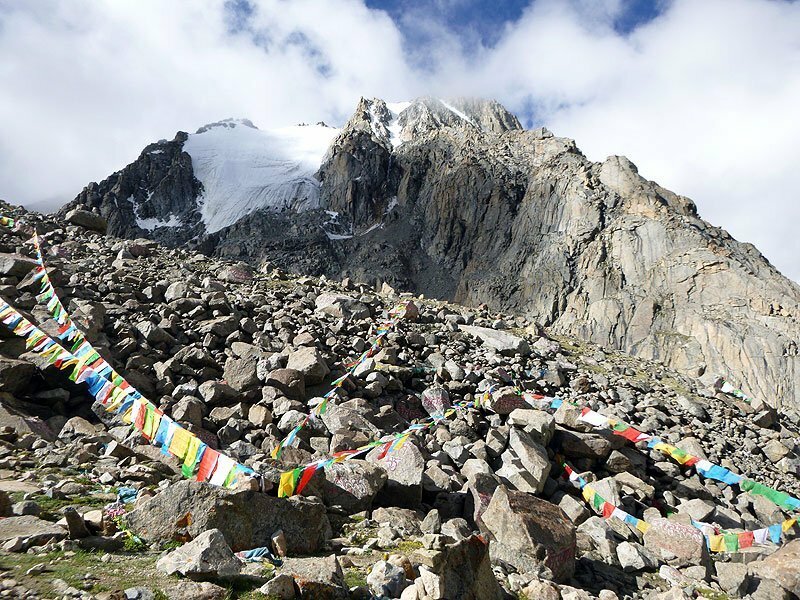 I had brought with me items from each of the Temples to offer and leave at Kailash. 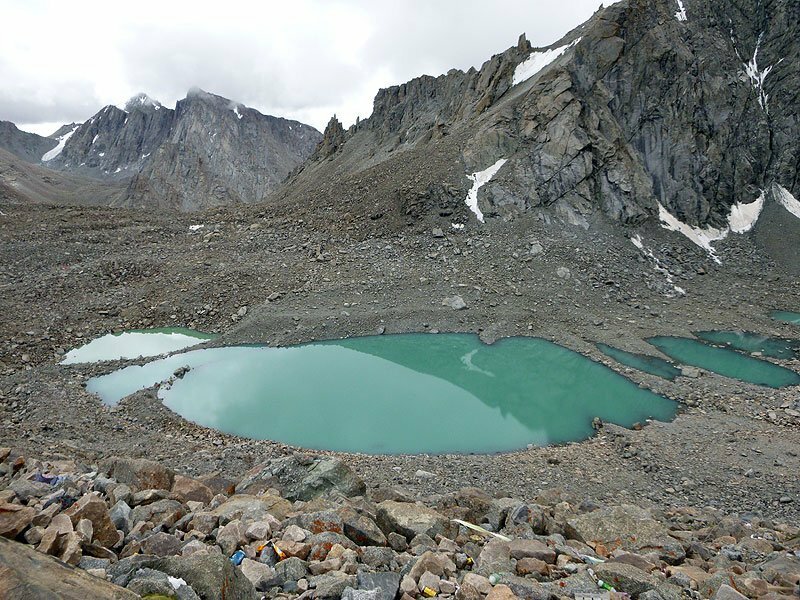 As I descended from the Dolma Pass, Gauri Kund was waiting; a series of small glacial ponds where Parvati performed tapas for Lord Shiva and also where She bathed. This was to be the place of offering. I quickly clambered down to the furthermost pond and unpacked everything. I placed a very special Vel from the Murugan Temple in the stony sand. Alongside it a pot full of Maa Kali’s tilacs from the Shakti Temple, and a small murthi of Lord Rama from the Sri Rangantha Temple. All alone, I started the most beautifully awesome little puja; sprinkling vibhuti from our Swiss Temple and tilacs from Sri Ranganatha into the water. Chanting to all aspects of the Divine, I lit the camphor (from Mother’s camphor garland) and alongside the Vel I placed a piece of paper with all the names of the Skanda Vale Community, my family and many others. 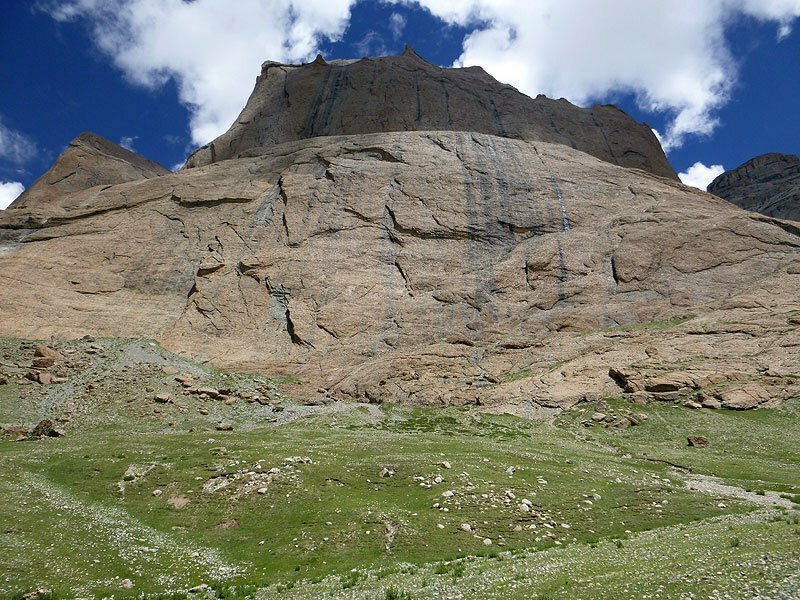 When the camphor had died down, a large cap stone was laid above everything, sealing Skanda Vale to Kailash. What a privilege! As light as a feather, I skipped back up the bouldered slope, joined the path and spent hours walking down this immense valley… so fulfilled, in total bliss. That evening the whole group was ablaze. Something had changed in all of us. 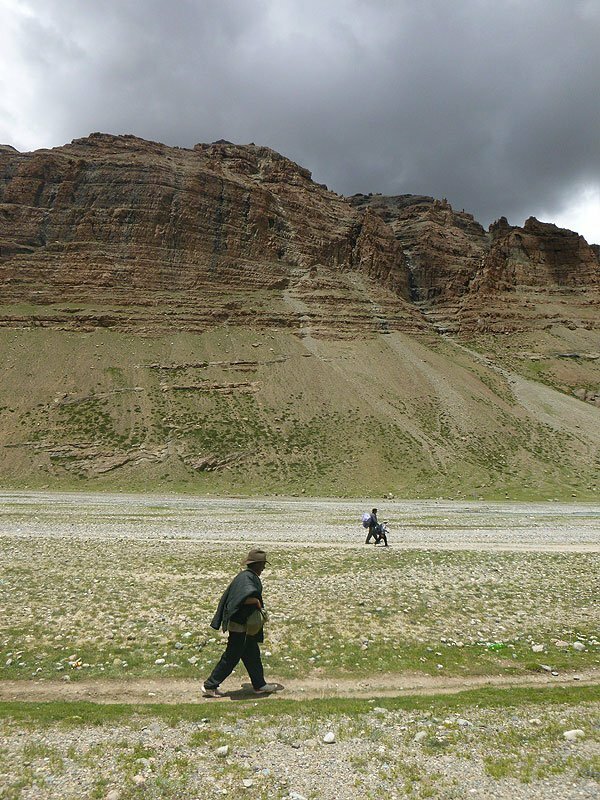 The following day it was just a short walk to complete the parikrama. On the way I must have collected 10 kilos of stones and rocks for all those back in the UK. I was hoping to see Kailash again on that last morning, but a ring of mountains firmly obscured any view of the south face. 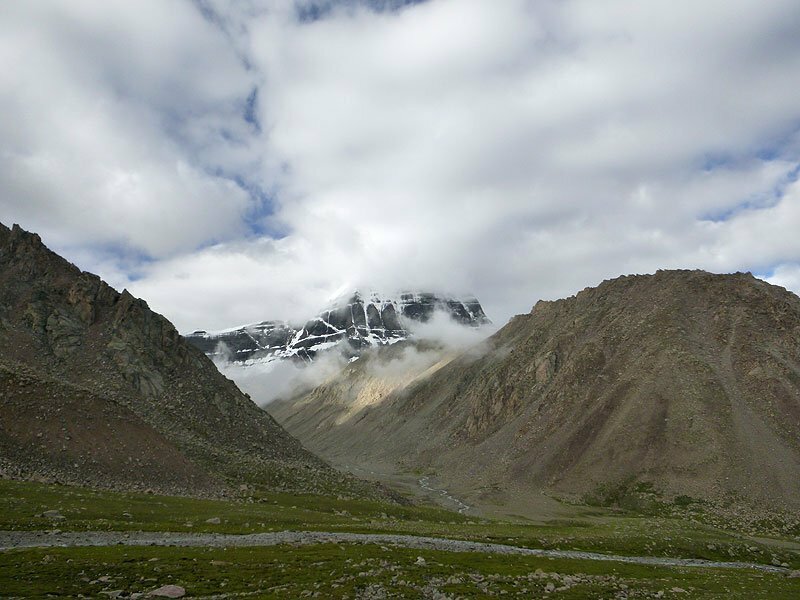 We boarded our coach and drove away from Darchen and from a distance the clouds lifted just enough for me to glimpse the base of Kailash… so beautiful. This small account would not be complete without a huge thank you to all those who enabled me to make the journey. Also to Mohanji, a true guru – for surely without him we would have travelled nowhere. 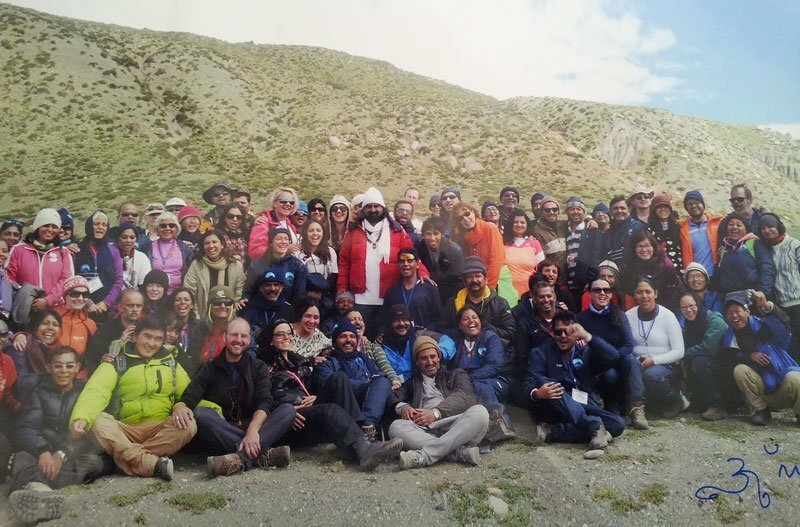 Thanks to his team and devotees, who were a stunning group of people to spend time with, and of course for all the grace that allowed me to realise my dream with Kailash.